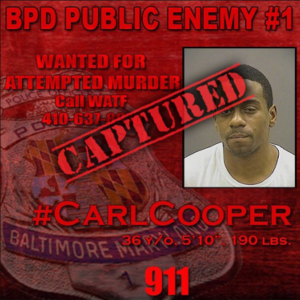 On March 4, 2016 Baltimore City Police announced the arrest of Carl Cooper. Cooper was arrested in Fayetteville, North Carolina. He is in custody and will be brought back to Baltimore to stand on charges involving this incident. On Monday, February 22, 2016, at approximately 1:00 p.m., officers responded to the 3400 block of Clifton Avenue, in the Walbrook Junction, for a report of a shooting. Upon officer’s arrival, they found two elderly people suffering from gunshot wounds. The victims were walking across the street from the shopping center to a corner food store when the shooting occurred (Initial reports were that the victims were catching a bus. Further information revealed that they arrived in a car and were walking across the street to get some food). An 82-year-old male victim was struck in his leg. A 90-year-old female was also struck in her leg. Initially, it was believed that she was struck by a bullet in the head because of a gash on her head. It was later determined through interviews and medical personnel that the injury occurred when she fell to the ground. Both of the injuries are described as non-life threatening. The victims are brother and sister. They were not the intended targets of this incident. They are being treated at a local hospital for their injuries where both are reported to be stable. The attached photo is that of the suspect in this incident. Police are urging anyone with information on this incident to contact the Citywide Shooting Section at 410-396-2221 or Metro Crime Stoppers at 1-866-7LOCKUP. The Bureau of Alcohol, Tobacco, Firearms and Explosives (ATF) is offering a reward of up to $10,000 for information leading to the arrest and conviction of the suspect in this case. Metro Crime Stoppers is also offering a reward of up to $2,000 in reference to this case.